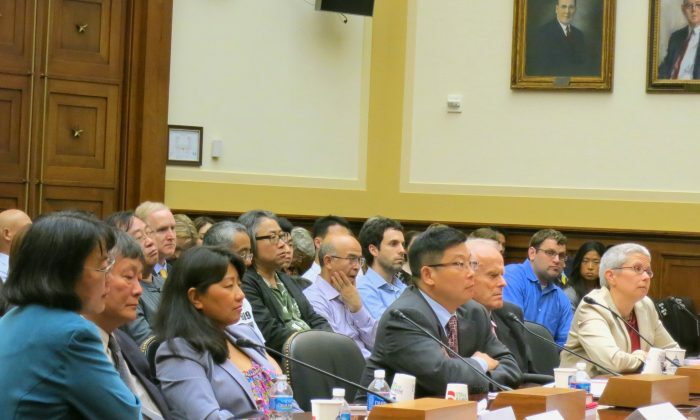 WASHINGTON—On the eve of the 24th anniversary of the Tiananmen Square massacre in China, human rights activists and researchers gathered on June 3 at the U.S. Congress to discuss the ways in which the U.S. administration should encourage, or perhaps constrain, the Chinese regime to respect the rights of its citizens. “On June 3rd and 4th [of 1989] and for days, weeks and years after right up until today, the Chinese dictatorship delivered a barbaric response” to student protesters gathered on Tiananmen Square, including “mass murder, torture, incarceration, cover-up, and the systematic suppression of fundamental human rights,” said Rep. Chris Smith (R-NJ), Chairman of the Subcommittee on Africa, Global Health, Global Human Rights, and International Organizations, under whose aegis the hearing was held. “The tragedy is one we should keep fresh in our minds, and learn from,” said Rep. Mark Meadows (R-NC), a member of the committee. After a recapping of the violent military suppression of the democracy protesters in and around Tiananmen Square—mention was made of tanks crushing screaming students, and machine guns being fired into crowds of young people—and noting that serious human rights violations persist in the communist country, the hearing turned to what the U.S. government could possibly do to impel change inside China. “It’s time to signal to the new Chinese leadership that the quality of its relation with the US largely depends on how it treats own citizens, and whether it lives by universally accepted human rights norms,” Rep. Stockman said. A number of representatives then used their time to ask questions of the witnesses about what specific policy measures they have been mulling over to try to get the Chinese regime, both notoriously intransigent and hypersensitive on the human rights question, to not treat its people so poorly. Sophie Richardson, the China director at Human Rights Watch, said that the U.S. approach to the Chinese regime’s rights abuses needs to move beyond “an endless series of diplomatic interactions” whose only purpose is to have been held. Human rights should be hammered at across every interaction with Chinese officials, she said, and could include a combination of discussion of abuses of specific groups, individual cases, and broad rule of law questions. “Doing that requires that the president instruct cabinet members to do this, follow through, and report back,” Richardson said. She also advised establishing actual benchmarks on key issues. “There has to become some kind of deliverable,” she said. Witness Chai Ling, a Chinese-American businesswoman and activist for women in China, was one of the more vocal of the student protesters in 1989. She peppered her testimony with Bible quotations and engaged in sometimes lengthy digressions about Christian principles as they apply to human rights. “The fruit of righteousness will be peace,” she noted at one point. Yang Jianli, a fellow Chinese-American former Tiananmen student who now runs a Washington-based non-profit that advocates for civil rights in China, proposed the very specific idea of providing tax incentives for American companies that invest in Chinese provinces that have fewer reports of human rights abuses. “We can encourage provincial leaders to compete for the best human rights record,” Yang said, much as they now compete on such things as GDP growth figures. David Aikman, a former reporter with Time Magazine, who was an eyewitness to the crackdown in 1989, suggested that holding a South African-style truth and reconciliation commission, which held the CCP to account for “these crimes they have committed,” would be helpful—though it was not clear what would compel the regime to submit to such a process. Aikman did make, however, the broad point that after having conducted a mass killing of hundreds and possibly thousands of innocent and unarmed citizens, that “It’s against civilization, against decency, and against truth” to deny it and not make any reparations to the victims.